It projects that the world fleet of jet planes will double over the next two decades, from about 24,000 commercial airplanes flying last year to more than 48,500 in 2037. FARNBOROUGH, England — Boeing unveiled its annual 20-year forecast for the airplane business at the Farnborough Air Show on Tuesday, reaffirming its very positive view in the ninth consecutive year of a soaring aviation market. That top-line figure parallels the Airbus 20-year forecast released earlier this month, although Airbus’s figure excludes freighter jets and the two rivals differ markedly over how the total is divided. Most of the growth is in emerging economies, as it has been for some time. Ten years ago, two-thirds of the world’s aircraft were in advanced economies, especially North America, Europe and Japan, with just one-third in emerging economies. Today the balance has tilted to 55-45 as emerging countries rapidly build their fleets. With the middle class in China set to become larger than the entire U.S. population within a decade, Boeing projects that China will overtake the U.S. within 10 to 15 years as the largest domestic airplane passenger market in the world. In an interview about the forecast, Boeing vice president of marketing Randy Tinseth dismissed the notion that a worldwide recession, a destructive trade war or some other disruption could derail the predictions. He pointed to the long, relentless climb in air traffic over many decades, spanning crises from the 1970s oil crisis to the September 11 terror attacks. 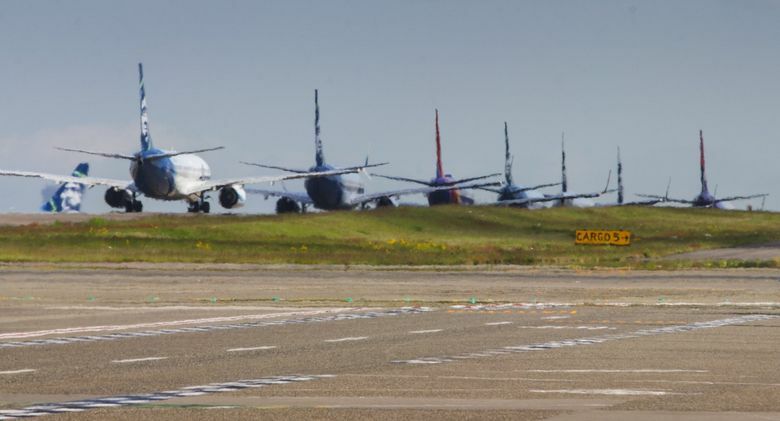 World air traffic has grown 70 percent over just the past 10 years, even though 2008 and 2009 were two of the worst recent years for the business, said Tinseth. As is by now standard for Boeing, Tinseth carefully avoided any public criticism of the policies of President Donald Trump, however counter they run to the free trade philosophy long espoused by the company. In addition to covering the growth in passenger traffic, newly built planes will have to replace about 19,000 older planes projected to retire in the next 20 years. So Boeing forecasts that to get to that 48,500 fleet size over the next two decades, manufacturers will have to build 42,700 planes. Of those, nearly three quarters, about 31,400, will be single-aisle planes and 8,000 will be widebody jets. In addition, Boeing predicts almost 1,000 freighter jets will be built, all of those more profitable widebody jets. The remaining 2,300 aircraft are small regional jets with less than 90 seats. The Airbus breakdown is not directly comparable because the European jetmaker uses different size categories in its forecast. And though Boeing includes some 3,400 freighters in the worldwide fleet of 48,000 in 20 years, Airbus’s similar total includes only passenger planes. Airbus’s forecast also predicts more planes will be retained in the fleet and fewer new planes will be needed to replace retiring aircraft. It projects 37,400 newly built passenger planes will be required over the next 20 years, which is 4,300 planes fewer than Boeing’s prediction for passenger planes. But predicting what will happen in 20 years is always an uncertain exercise. Looking at the 20-year Boeing forecast that used 1999 figures to project the 2019 fleet does not inspire confidence in the accuracy of these models. Back then Boeing projected the worldwide total jet fleet in 2019 would reach nearly 32,000 aircraft. The total fleet last year was 24,400 and if it grows as the latest forecast predicts at an average of 3.5 percent per year, then it should by 2019 reach just over 26,000 aircraft. Predicting more near term, say five years out, is generally more accurate. Yet there are also substantial swings in such shorter periods. For example, the air freighter market — where Boeing has a virtual monopoly today — was hit very hard in the 2008 financial crisis, and was stagnant for years afterwards. Then, in the past two years, it has come back strongly. Tinseth said that since the start off 2015, Boeing has sold 150 freighter jets. “The freighter market is very important to our production plans,” Tinseth said. The big bump in cargo demand is evident at Farnborough. On the opening day of the Air Show, Boeing announced orders from express cargo carrier DHL for 14 Boeing 777 freighter jets and from Qatar Airways for five more 777 Fs. Tuesday at the Show proved another blockbuster day for cargo jets. Russian air freight company Volga-Dnepr Group and affilated U.K. company CargoLogicHolding signed a letter of intent to acquire 29 Boeing 777 Freighters and confirmed an order for five Boeing 747-8 jumbo jet freighters. All those 777F orders are particularly significant because they help sustain production of the 777 line in Everett ahead of the ramp up of the forthcoming 777X. And yet, earlier this month the International Air Transport Association (IATA) warned that the growth in air cargo demand is slowing and blamed the incipient trade war. Asked about the potential impact of a trade war, Tinseth declined to comment. And asked about China/U.S. trade specifically, he avoided addressing the deteriorating relationship and chose instead to talk about Boeing’s importance to China, as if that should offer some protection. In Boeing’s long view, everything will work out fine in the end. Never mind the short term chaos. Of course, Boeing’s forecast doesn’t attempt to address who exactly will build the huge fleet of 42,700 new airplanes it projects. China by then will certainly be playing a larger manufacturing role than it does today.